Well school has started for me, and I’ll be working on things ranging from assembly to AI. I’m pretty excited to be back in the saddle learning new things and getting back into the swing of things. Working on projects by yourself is great but there’s nothing like a competitive environment to motivate you to go above and beyond the norm. I’ve been meeting with my new team to bang out game ideas and things and that has gotten me back onto my physics engine work. Though I haven’t really mentioned it, I’ve been on and off working a 3D physics engine. I’m planning on supporting a few shapes and some rotation (which for those unfamiliar with physics engines, is no small feat), but not much else beyond that. Below, I’ve posted a crucial and difficult part of the physics engine, which is resolving velocity. This is the function before I will have modified it for rotation, which makes it quite a bit more difficult. I omitted the function comments for space sake, and the code embedding on here gets rid of my formatting, so it’ll look a little flat, but this is what I’m using resolve the velocity of objects in my objects at the moment. So at this point I can get cubes to bump into each other or spheres to do the same. 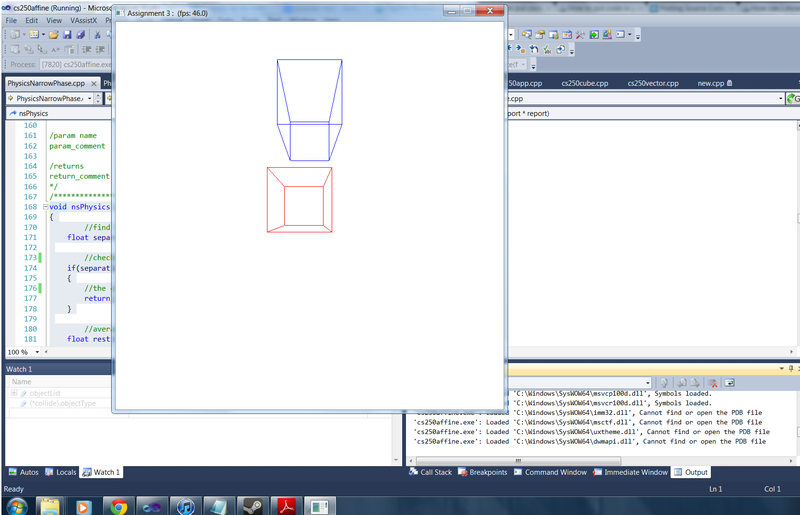 As I mentioned earlier, there is no rotation yet, but it’s a definite start, and I can even start prototyping (sorta). Other important parts of the code that will need to be modified heavily will be the shape shape interaction code, which gathers the data from the actual collision. If you’re curious what a work in progress physics engine looks like, why just look below! Well that’s about it for now. I will leave you folks with another song to code to, since I’ve been coding quite a bit lately. This next one is a bit unorthodox, but I like it. It’s the ending song from Bastion which, by the way, is an incredible game and everyone should go play it. Anyways, its a bit slow, a little melancholy, but definitely focuses me when I’m trying to code. Suggestions for songs to code to are always appreciated! Looks nice and confusing. Good luck.